(Newser) – It's debate-prep time for Paul Ryan, whose advisers admit he will be up against a seasoned pro when he faces Joe Biden on Oct. 11. Biden "is one of the most experienced debaters in American political life and we definitely don’t take the challenge lightly," an adviser says. Ryan's first full prep day is tomorrow, when he goes to a backwoods area of Oregon with his team for the first of several sessions, reports NBC News. I love how the GOP candidates always have to take so much prep time. From Bush to Palin to Romney to Ryan, they try to bone up in a few weeks after a lifetime of intellectual laziness and spewing false information. "Ryan lies low"..... he's about as low as he can get! 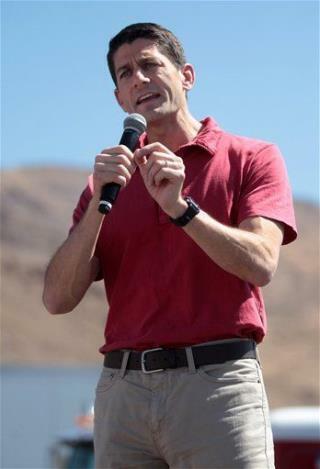 Ryan Lies Low to Prep for Biden Debate. Ryan lies low he lies high he lies east he lies west he lies north he lies south he lies up he lies down he lies in he lies out he lies from the top he lies from the bottom he lies when he speaks he lies when he sleep he lies when he is awake this guy has never spokenthe truth in his life.